Airbus has revealed the A220 at a ceremony held at its Henri-Ziegler Delivery Centre, near Toulouse. Witnessed by Airbus employees and members of the global news media, the A220-300 landed directly from the painting at 12:25 am CEST wearing its new Airbus name and colours. 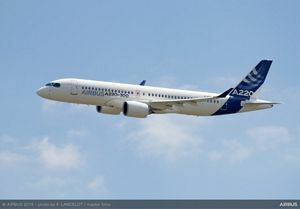 The A220 family comprises two models, the A220-100 and A220-300, formerly Bombardier Inc.’s C Series (CS100 and CS300). The aircraft are fully optimized for the 100 to 150 seat market and perfectly complement Airbus’ existing best-selling A320neo family. All times are GMT +8. The time now is 02:49 PM.